Here are my top 11 tips and tricks for getting things done faster with the Visual Studio 2005 IDE (without using third-party add-ins or upgrading hardware… that’s another article). Yes, some of these tips and tricks may fall into the “obvious” category, but I think they are worth repeating. I continue to see too many .NET developers not taking advantage of even the basic time-saving techniques. I work mostly with C# so some of these tips may not apply to, or work differently with other Visual Studio languages such as Visual Basic.NET. Regular Expressions is a powerful and portable text search/replace/transformation language. Learning basic Regular Expressions will immediately make you a more productive developer/power user. Regular Expressions is supported in Visual Studio’s various Search/Replace dialogs. Any Regular Expressions skill you learn will also be useful in numerous other applications and settings: other text editors, unix shell/egrep, PowerShell, input validation, and Google search (heh, just kidding on that last item). You can also use Regular Expressions with macros and automation via the Regex class. Explanation? Basically, the “Find what” expression above matches the content of each line and give it a numbered “tag”. The “Replace with” expression then replaces each line with the first tagged value (\1), wrapped around in + ” “. Click the fly-out (triangle) button next to each box to display a cheat-sheet of frequently used expressions. Oh, and don’t worry about the “+” string concatenations in the example, the compiler knows to optimize that syntax. Once you’ve created a few Search/Replace expressions like the above, create macros out of them and assign to shortcuts. Surrounds each line with (example above). Transform a list of values separated by newlines into a coma-delimited list (used in array initializers or SQL where clause). Put double quotes around each value in a coma-separated list. The Regulator is a free GUI to compose/test your Regular Expressions. Nregex - AJAX web site. MSDN - How to: Search with Regular Expressions. Using keyboard shortcuts is the best way to get things done faster in Visual Studio (and most other computer applications for that matter). Below are my favorite Visual Studio keyboard shortcuts (VB.NET. I am leaving out the really obvious ones like F5). CTRL+ALT+L: View Solution Explorer. I use Auto Hide for all of my tool windows to maximize screen real estate. Whenever I need to open the Solution Explorer, it’s just a shortcut away. Related shortcuts: CTRL+ALT+X (Toolbox), F4 (Properties), CTRL+ALT+O (Output), CTRL+\, E (Error List), CTRL+\, T (Task List). F10: Debug - step over. Related debugging shortcuts: F5 (debug - start), F11 (debug - step into), SHIFT-F11 (debug - step out), CTRL-F10 (debug - run to cursor). 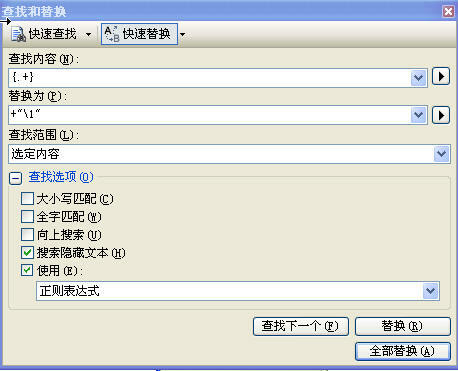 F9 (toggle breakpoint). CTRL+D or CTRL+/: Find combo (see section on Find Combo below). CTRL+M, O: Collapse to Definitions. This is usually the first thing I do when opening up a new class. CTRL+K, CTRL+C: Comment block. CTRL+K, CTRL-U (uncomment selected block). ALT+B, B: Build Solution. Related shortcuts: ALT+B, U (build selected Project), ALT+B, R (rebuild Solution). SHIFT+ALT+Enter: Toggle full screen mode. This is especially useful if you have a small monitor. Since I upgraded to dual 17″ monitors, I no longer needed to use full screen mode. CTRL+K, X: Insert “surrounds with” code snippet. See Snippets tip below. CTRL+B, T: Toggle bookmark. Related: CTRL+B, N (next bookmark), CTRL+B, P (prev bookmark). The complete list of default shortcuts is available from VS 2005 Documentation. You can also download/print reference posters from Microsoft: C# Keyboard Reference Poster, VB.NET Keyboard Reference Poster. Choose Tools/Options and select Environment/Keyboard. Type in something into “Show commands containing” to get a list of matching commands. If there is already a shortcut for the selected command, it’ll be displayed in “Shortcuts for selected command”. To assign a new shortcut to the selected command, put the cursor in “Press shortcut keys” and press the shortcut key or key combinations desired. CTRL+Num, T: Show the Test View. CTRL+Num, D: Start debugging the selected Unit Test in Test View. CTRL+’, L: “Collapse all in Solution Explorer ” macro (see Macros section below). CTRL+’, S: “Surrounds each line with” Macro. CTRL+’, C: Compare with previous Source Control version. Save time typing repetitive code by using Code Snippets. There are two types of Snippets in Visual Studio 2005: Exansion and SurroundsWith. To use Expansion Snippets, type the Snippet shortcut (not to be confused with keyboard shortcuts), and press Tab twice. #region: Regions is a great way to organize your code. using: If you create an IDisposable object, you should use the “using” pattern. 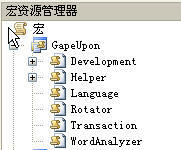 In addition to the basic “using” Snippet, I also created several variations for TransactionScope, and IDataReader. Find yourself constantly switching to the Design view every time you create/open an ASPX page? Cannot locate your current file in the Solution Explorer? Easy… just change the right settings and never think about it again. Open HTML pages in Source View: Tools/Options/HTML Designer/Start pages in. Track the current file in Solution Explorer: Tools/Options/Projects and Solutions/Track Active Item in Solution Explorer. Change the Start page or get rid of it: Tools/Options/Environment/Startup. Change the default font-size to a smaller size so you can see more code. My editor font setting is ProFontWindows at size 9. Turn of animations: Uncheck Tools/Options/Environment/Animate environment tools. How often have you found yourself repeatedly stepping through a loop while debugging, waiting to get to a specific loop value (because the bug only occurs with that specific value)? With Conditional Breakpoints, you don’t have to do that. Just set a Breakpoint Condition. Another debugging productivity trick I use is to override ToString() to return a useful summary of your objects. The Debugger uses the value returned by ToString in various Debug windows such as Watch Window. You can also use the DebuggerDisplay attribute. Use Task List tokens such as TODO and HACK to quickly mark incomplete code or code that requires further attention. This allows you to keep flowing and skip over the details, but at the same time ensures that you will not forget to go back and finish up. A shortcoming with Visual Studio 2005’s Task List is that it only shows the items in the current file. You can get around this by using the Find in Files feature and search for “// TODO”. To quickly go to a file, type CTRL+D, >open <start of file name>. Intellisense works here just like in the Command Window. “of” (short for “open file”) can be used instead of open. Compare this with opening Solution Explorer, expand the correct folder/project, and visually hunt for the file you need. Type-ahead search works in many Visual Studio lists such as Solution Explorer, Active Files Combo (CTRL+ALT+Down Arrow), Add References, Class View, Attach to Process, Test View, etc. To see how it works, it’s best to try it yourself. Open the Solution Explorer and start typing the first few letters of a visible file. I save this for last because I think macros and Automation have the potential to give you the biggest productivity booster, but also require the most initial time investment. For many developers, the most effective way to take advantage of macros is to find and use or customize someone else’s macros. If you want to get started with writing your own macros, the first feature you should get familiarize yourself with is the Macro Recording feature (shortcut CTRL+SHIFT+R).